Food Business Unpacked is a quarterly experience that presents our community with an evening of inspiring stories from food and beverage leaders throughout Oregon and an opportunity to mingle with other like-minded professionals. The current food and beverage landscape is a highly competitive industry in which companies are always looking for more innovative ways to attack sales and to build their brand. 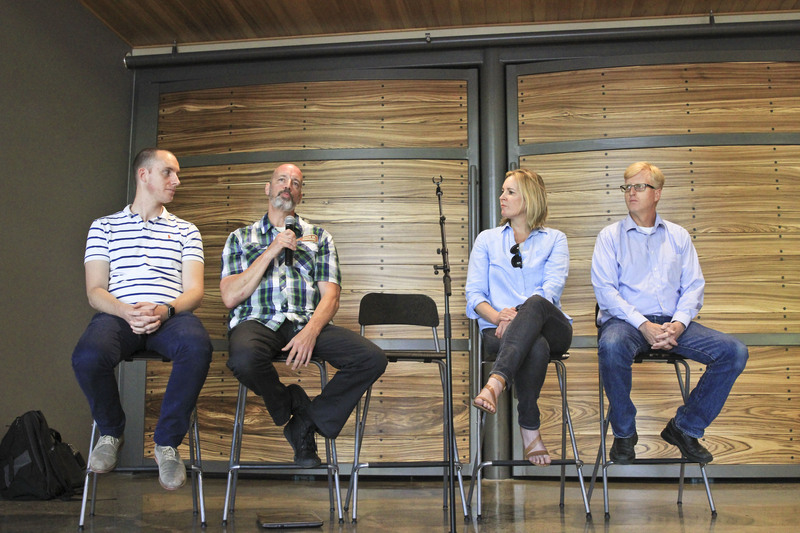 June’s session Food Business Unpacked: Choose the Right Sales Channel showcased four panelists who shared their expertise and perspective on successes and pitfalls in growing a company and increasing customer base. These experiences shed light on the absolute importance of building relationships with buyers and customers in order to stay on top of the competition. Singing Dog Vanilla was founded on April Fool’s day in 2004. As the company’s sales have grown to include thousands of accounts from all over the world, it has never looked back on using a direct distribution model. Most people think doing self-distribution is about trying to keep a company’s cost down, but they see this model in a different way. Marty Parisen says, “For our company, it was more of a competitive move; as all of our competitors were using the same distributors. We were able to go direct and offer something that distributors were not offering”. Self-distribution created an opportunity for exclusivity and other pricing benefits, especially when working with smaller independent and regional grocers like Market of Choice. Brew Dr. Kombucha launched 10 years ago and has explored a number of distribution channels along the way. Like many new companies, they started out self-distributing out of necessity. With time however, they saw the value in working distribution companies because it connected them with the large accounts they needed to grow and saturate the market. However, as Larry McGrath explains, “We also continue to self-distribute because the distributors don’t do that well reaching smaller companies. We have had enough success with it and it has been profitable enough, despite being a small segment of our business, that we are looking into duplicating this model in other states”. For example, McGrath mentioned an account in Bend that was a smaller convenience store that at the time sold primarily just gas and beer. After a couple of conversations and education, their product was launched in the store. They went from two bottles of Kombucha to finally introducing them to an eight-tap system. Their Kombucha sales were initially $5,000 but went to $60,000. It is all about noticing what is working for different companies, big and small, and seeing where there needs to be more support. Taking the time to invest and educate buyers turns them from little buyers to big buyers. Corey Thomas’s professional background is in building Amazon sales for businesses. He helped a company of $500,000 grow to $20 million in just 3 years using this model. Amazon has started a big push into the grocery realm with its recent acquisition of Whole Foods. There is a sizable opportunity for food companies to leverage this opportunity. Research firm Consumer Intelligence Research Partners states that there are approximately 90 million Prime members in the United States, which would be around 77% of the nation’s 116 million households, according to the U.S. Census”. RUN AMZ’s clients are demonstrating that Amazon sales can be a very productive channel. The convenience of getting groceries in two hours, or being able to receive a product in two days is a pretty compelling incentive for consumers to purchase via Amazon. The overarching theme in any sales process is building a relationship with customers and making sure there is clear communication. Without a bridge to the customer and access to the seller, companies aren’t able to build the trust that’s required to increase their product’s reach. Even though it seems self-evident that we place value on the client relationship, this is surprisingly overlooked by many companies. In the discussions, we were able to gain a glimpse of how these companies are thriving because of their commitment to building authentic relationships with a solid customer base.Panelists discussed the ways that their companies navigate the difficulties of building relationships with new buyers and the potential pitfalls that can occur as buyers transition in and out. It is often difficult for young companies to get their footing in the hearts and minds of the individuals that make the decisions that most impact sales. Nadine McCrindle shared some of her experiences with the group. “When we first started, we didn’t realize you had to build the relationship. The better the relationship you can build with a buyer the more likely it will result in a long-term relationship. It could save you when your product is at the bottom five of an annual sales report and they are trying to figure out how to trim their category”. Relationships are also key for creating new market opportunities, and it often takes a lot of time to see a return on the time spent building and maintaining these. In a crowded, and occasionally oversaturated landscape, relationships are the pipeline that allows effective communication of a brand’s message. The Food Business Unpacked is an event that brings a diverse group of people together, in a casual environment, to share a bite, network and learn something new along the way. “It is always fun to get together with members of this community, and part of the reason I enjoy working with food and beverage companies in the Eugene area is that these people launch and lead these companies that are incredibly diverse and have a real passion that’s contagious. The community is a really good group of people and they are fun to hang out with,” said Micah Elconin, RAIN Mentor and Lane Food and Beverage Sector Strategist. One component of RAIN Eugene are educational experiences, but it is undoubtedly the value of connectivity that ties entrepreneurs and community members together. These introductions and interactions are so vital for people who are in the early stage businesses. Building a competitive business is more than just having a good idea, it’s about having a great network and growing community. Stay tuned for details on the next event, which is scheduled to take place at the end of September. Details will be provided soon.